A Catholic Rev. Father accidentally took his own life last Sunday morning in his house inside Saint Thomas Moore Catholic church in Sobe, Owan W. LGA of Edo State. Rev Father Peter Ayala reportedly killed himself while cleaning his double-barrel gun before the morning mass. We learnt the accidental gun-discharge incident happened when some of the worshippers had already gathered for worship around 7am. According to sources, when the worshippers heard a lound sound of gun from his house, church elders immediately rushed to his apartment. They found the Rev. father lying in a pool of his own blood, an incident that threw the whole church into disarray. The Church elders were said to have reported the incident to the Bishop of Auchi Diocese, Dr Gabriel Duniya, who also was told by security agents that the priest died when the rifle he was cleaning went off. Heya! May his soul rest in perfect peace. Una sure say no be suicide?…cos Nigerians do good cover-up stories!! !…but rest in peace Priest! For me I believe somebody murdered the priest Come to think of it, weather he shot himself or not , what did those people staying with him do when they heard the gun shot, or does it mean that they did not hear the gun shot. How can he be cleaning his gun when he was already dressed for Sunday Mass, all am saying is that they should conduct a proper investigation and stop rubbishing the dead man’s image. 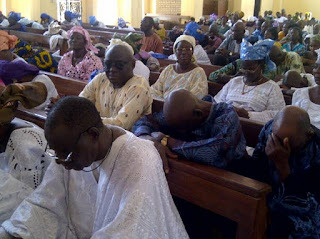 Wetin Rev father use gun for, Is dat gun greater than God’s protection? All mst every Rev fr hv gun. And dat gun is 4 security purpose. I confusing myself within dis stories lining. I wondering d criminal possiblnesses of d Revrnd. It didnt clear. BUT HE SHOULD BE ABLE TO KNOW HOW TO USE THE GUN.AND WHEN CLEANING IT HE SHOULD KNOW WHAT TO DO. MAY HIS SOUL REST IN PEACE. Why in the first place putting bullets in a gun you are cleaning ? This might be a covered suicide, let the police do their Homework well ! Wetin im wont carry gun do for mass? Na gun be Bible or Holy Communion, dis is not real! Besides who gave him the gun, what is he doing with a gun? is he suppose to kill life or save life? Rest in peace iz all we hve got to say. How did he get ahold of the gun? How would they know it wasn’t suicide? Let’s leave it to God bcos people, especially the media know how to frame story. They can tell u how heaven they ain’t be to looks like. So, he rather put his life in the gun for security instead of God. Live by d Gun,die by d Gun!!! Wot is a reverend father doin wit a Gun.Imagine d kinda world we nw live in,shuo.I tire O.Wot excuse does he hav?for protection,to scare…….som1 shuld pls explain. I wonder What priest was doing with gun! Is dat, his bible or d rosary? @smart am the one that gave him the gun. How can a priest have gun wit him?is it for what purpose? Eya! Rest in peace my priest.maybe he is using the gun for security popurse. Amed robbers in Nigeria dey make priest dey use gun. Chai! What a country!! Good News…Your dirty soul shall roast in HELL Forever…. may God forgive you.who r u to judge? Be careful! God sees and judges even our inner most thought. Do not condem. D MEASURE U GIVE D MEASURE U RECIEVE. Though it has happened, I pray God to take his soul, Perhaps, I urge other Rev. fathers handling weapons to humbly lay them down & depend only on God for protection irrespective of the level of terrorization in Nigeria for this has taught us that personal security is vanity outside God. No wonder he became a terror against himself if this is not just fabrications. wether suicide or homicide R.I.P father. Judge n Barristeq Ohio, do not let ur own words or thinking lead u astray. Who made u a judge. May God forgive u bcos u ve judged n condemed a prophet. Where u there, why not b in a safer side by keeping quiet than saying what u dont know. Be careful, TOUCH NOT MY ANOINTED AND DO MY PROPHET NO HARM. May God bless u 4 these explaination n sincerety, Rita. its surprising,was he drunk or what? 1) What is d scene of dis incident like? 2) Does d late Rev. Finger print appear on dat gun? 3) what was d position of d gun and d Rev’s body? 4) The bullet found in d Rev’s body, is it d bullet dat a double barrel uses? 4) Does a priest live alone? 5) if he was really servicing d gun, is it possible dat e would do dat d very Sunday morning e was surpose to minister? 6) wot kind of key does e use? 7) the kind of spanner e brought out, is dere any nut dat it can lose? 8) Has anybody ever found him wit such gun, goin to hunt? 9) Does dat looked just fired wen d church 1st got dere? U make sense Dear. Thank u. • . Peter Ayala, may your gentle soul rest in perfect peace. From my knowledge of you, I believed that you may not have committed suicide, because you have a very strong faith in God while you lived. Do not mind what people are saying about your death because people can say whatever they like, but it is what God says that matters. You were an example of a good priest of God. You were not a man of too many words. You loved a life of solitude and mortification. You were not materialistic. Even though you had not much materially, but you always shared the little you had with the needy. You were selfless, kind hearted, generous, humble, quiet and prayerful. I remembered the last time we spoke on telephone, a day before the day you passed on, you were telling me about your devotion to the precious blood of our Lord Jesus Christ, whom you Loved, served and were devoted to while you were alive, you never sounded frustrated. You also told me of your fish pound and how the fishes would mature in six months’ time. If you were frustrated or loosed hope, how come you newly started a fish pound you were planning to harvest in a six months’ time? How come, they said a gun was beside you? If you were truly cleaning a gun as people said, they gun would have shot something else not you, any way God knows the truth. Just as the Lord Jesus prayed for those who persecuted Him, that they be forgiven, I know you as a man of God who forgives easily, please, I beg you that you forgive them for they do not know what they did. I would not forget your popular saying –“The Lord knows everything and that there is nothing hidden from God” I am very sure that the Lord knows everything that happened to you. I know you must have suffered severe pains before you finally gave up the ghost, but Fr, Buoro , go well, even if people are saying anything they like concerning your death, the Lord alone knows the truth and the legacy you left behind would speak for you always. May the God of Mercy reward you for your good deeds to the poor, the helpless and the abandoned. Father of the poor, go well! Defender of the defenseless, Adieu! Hope of the forsaken, bye- bye! May the Lord grant your gentle soul, everlasting rest in His Kingdom. Be sure of our masses, prayers and sacrifices for you sake. Bye Fr. Ayala, Adieu, Fr.Odion, Go well Fr. Buoro. We will miss your gentle smile, sincere advice, charitable deeds and prayers. May your soul and the souls of the faithful departed; through the Mercy of God may you rest in Peace Amen. What is he doing with gun?The church authority must be questioned.